Original hand painted pottery. Quirky illustrations painted onto a wide range of ceramics. Personalised gifts for all occasions. Wonderful Signature Plates & Platters. Tile Murals. A wonderful alternative to the traditional guest book, ideal for any occasion, weddings, birthdays, anniversaries, christenings. Get your family & friends to sign a plate. Commission one of my quirky illustrations hand painted onto a plate, platter, bowl, mug, jug, teapot, dish & clock. Hand painted tiles, original designs & bespoke tile murals. Commission a black & white drawing. Elizabeth Clark is a ceramics artist and illustrator and has a BA Honours degree in Ceramics, Art & Design from Edinburgh College of Art. She has exhibited her work in London at the Victoria & Albert Museum, Hyper Hyper South Kensington, and at galleries in Edinburgh and Glasgow. 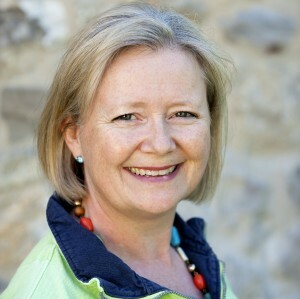 She has also worked with the BBC & with Schools on various pottery painting projects. 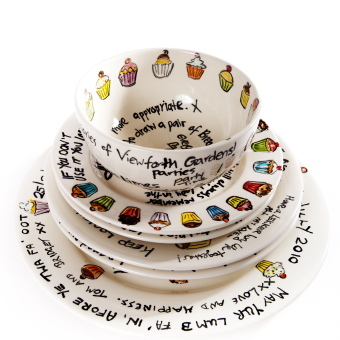 Each piece of pottery is individually hand painted by Elizabeth & it can be personalised to your specific requirments. You can choose from one of her standard designs or let Elizabeth create a unique bespoke design to suit the occasion. Elizabeth works on commission & each item of ceramics she paints is a one-off piece of art individually designed for the customer. Elizabeth lives with her husband Andrew and works from her studio in Yeovil, Somerset. "Hello Elizabeth Just a quick note to say thank you for doing the dish for me to give to my wife. It looks brilliant and she was over come with it when she opened the box last Wednesday. Thank you again and I shall certainly be pleased to tell others about you and what you do. Best wishes Anthony Everitt - October 18th 2011"
Thanks so much for the bespoke platter ... It's absolutely fantastic. We received it yesterday and took it to the pub to collect signatures, so many people were amazed. They knew they'd "chipped in" for a plate but didn't really know what to expect. John is going to be absolutely delighted - it's a fitting and memorable reminder of when he was the landlord. Thanks once again, and I'm sure you'll get an order from us again. If you would like us to ring you back, simply send us your phone number and we will call you.